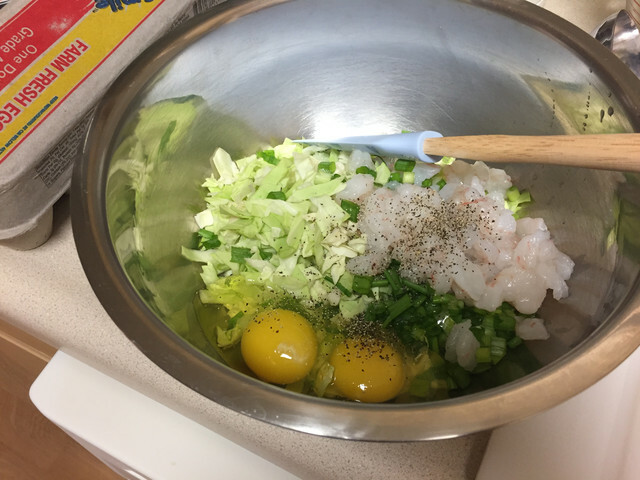 Makes 5-6 medium sized Okonomiyaki. I was cooking for 5 people- definitely size down if you’re by yourself! 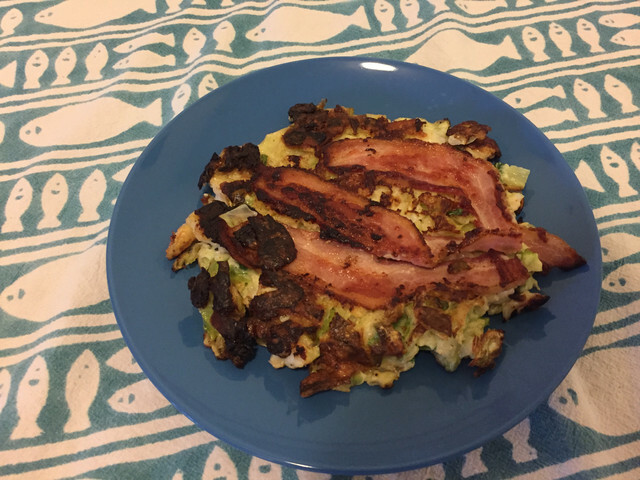 To see a recipe for one person, check out this similar recipe on my personal food blog. 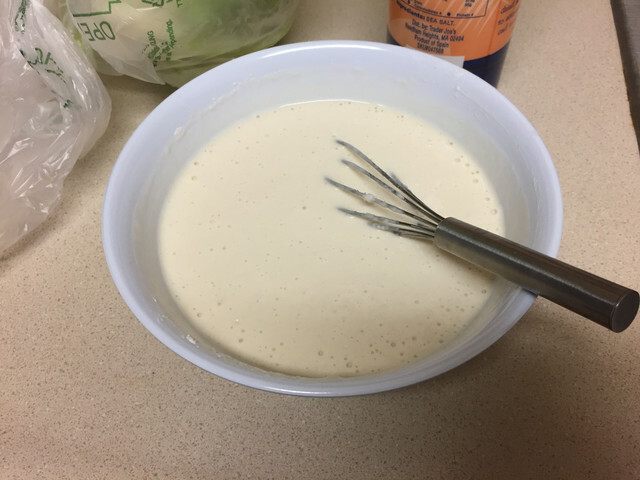 First step is to mix the batter. Mix water and flour together with a healthy pinch of salt. Set aside. 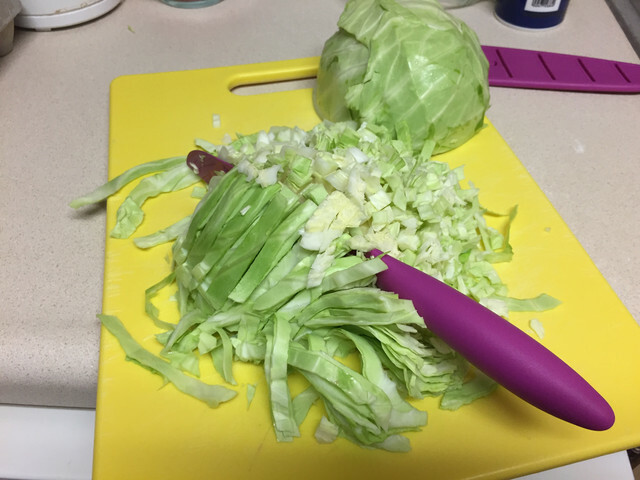 Chop cabbage into cubes. First, half cabbage, and set the other half aside. 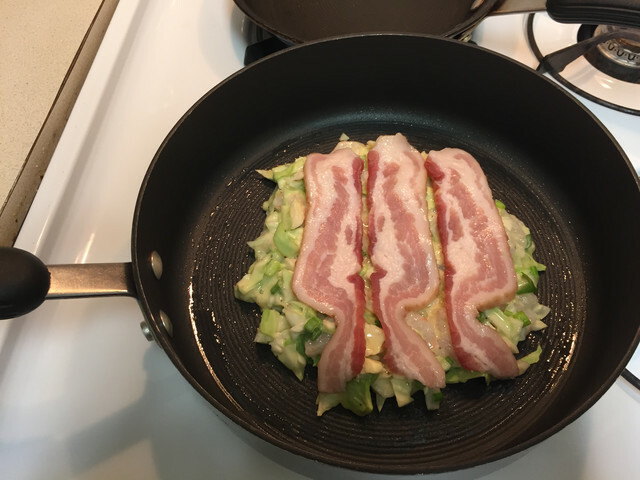 Cut into strips, and then cut again on the opposite side to create cubes of cabbage. Set aside. Prepare the fillings. 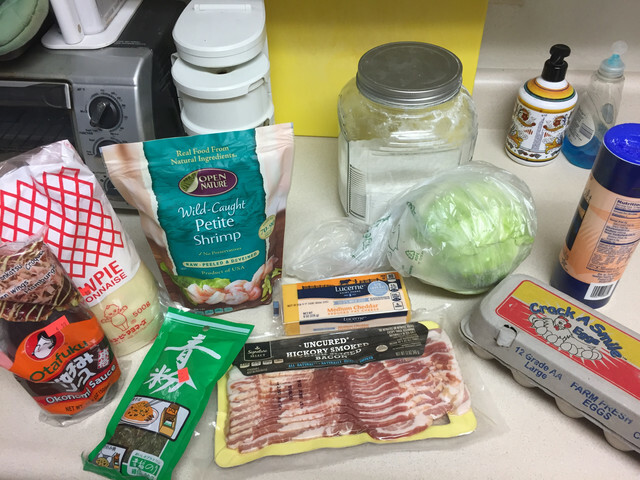 One kind of okonimyaki will be shrimp and bacon. The other kind will have cubes of cheese in the batter, with bacon fried on top. That means I needed to defrost and roughly chop the shrimp, and then cube my cheese. 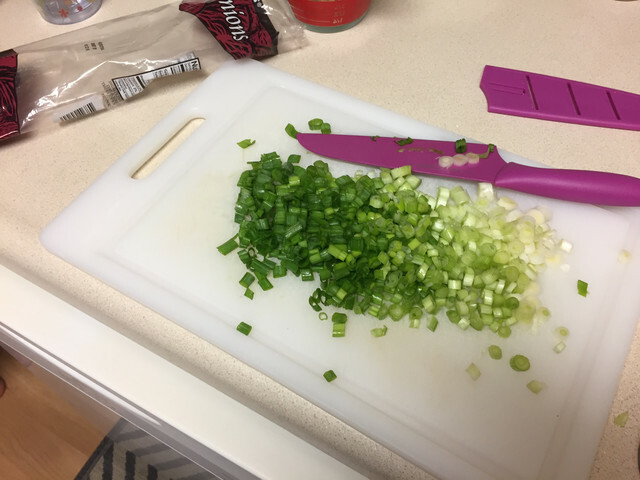 Also, finely chop green onion while you’re at it. 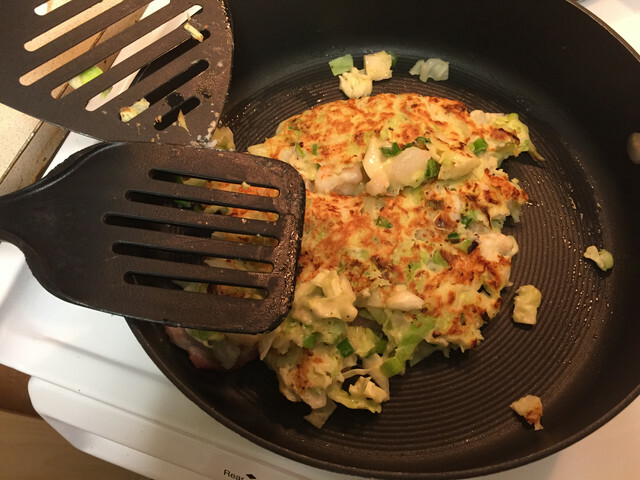 When you’re ready to start cooking, mix roughly half of your batter with half of your cabbage. Crack in half of your eggs, season with salt and pepper, and pour in the filling of your choice. 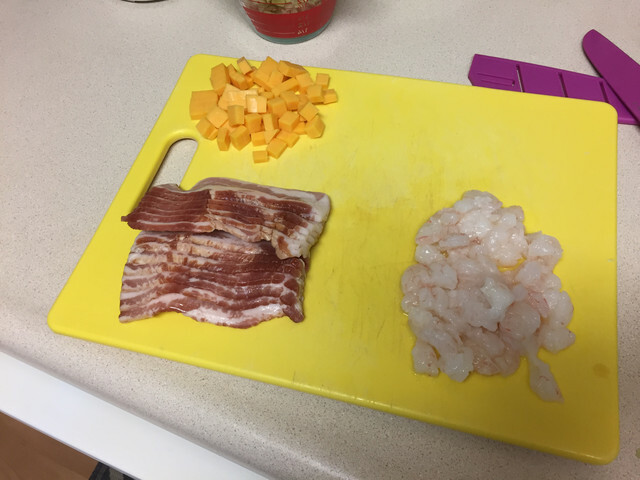 For this one, I started with the shrimp. 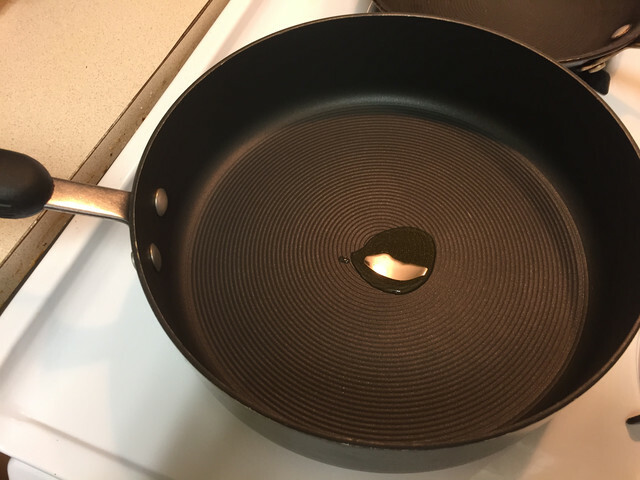 Turn your range onto medium heat, and oil the pan with olive oil. Ladle in a big scoop of the mixture, about 1/3 of the total batter, and push into a flat, round circle. Let cook for 3 minutes. While waiting, layer bacon slices on top. After 3-4 minutes, flip this sucker over. Get two spatulas and just go to town. I can guarantee you some of it is going to fall out- this is ok. Just gently push it back together, and you’ll be fine. 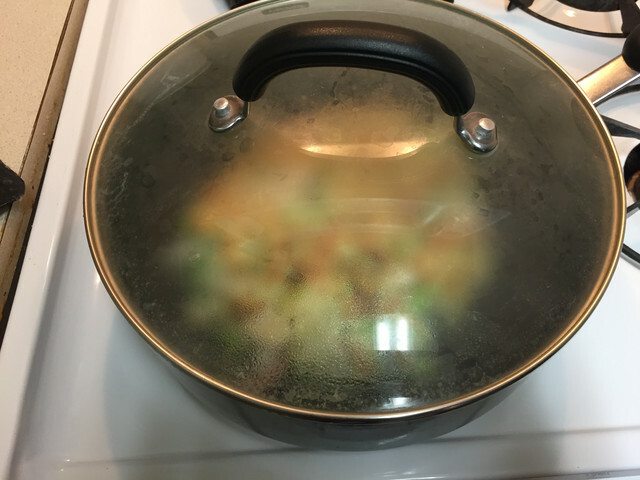 Cover with a lid and let cook 4 minutes. 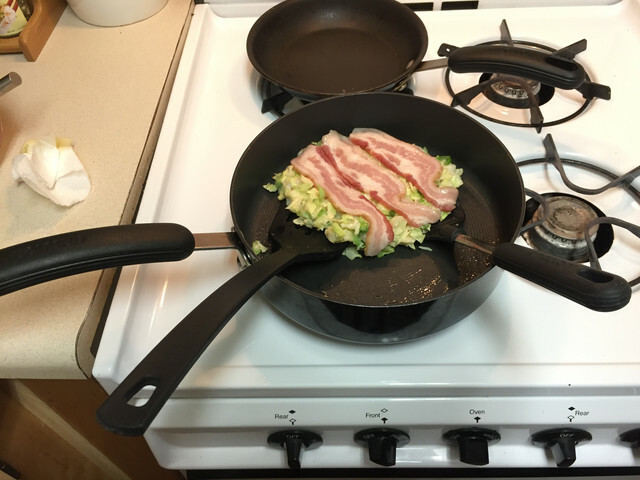 Take the lid off, and flip back over, so bacon is up. Allow to cook for another 3 minutes. If all the cooking tires you, just remember that this is a very thick pancake, and you don’t want to serve up a meal that is raw inside. Even though it won’t look like anything is really changing, be patient, and wait it out for this meal. 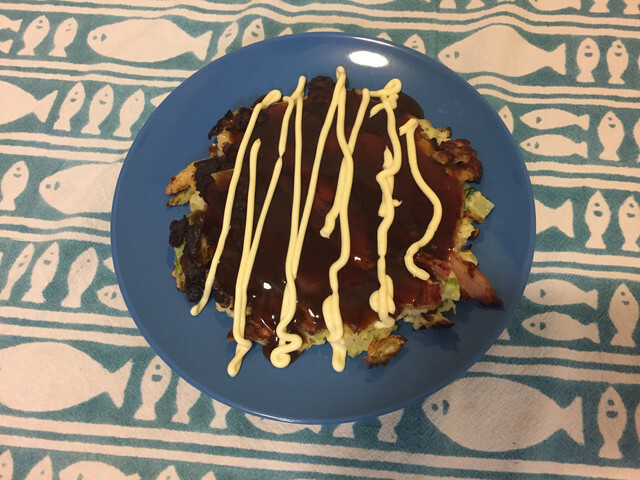 Finally, after the last cook, plate your okonomiyaki! 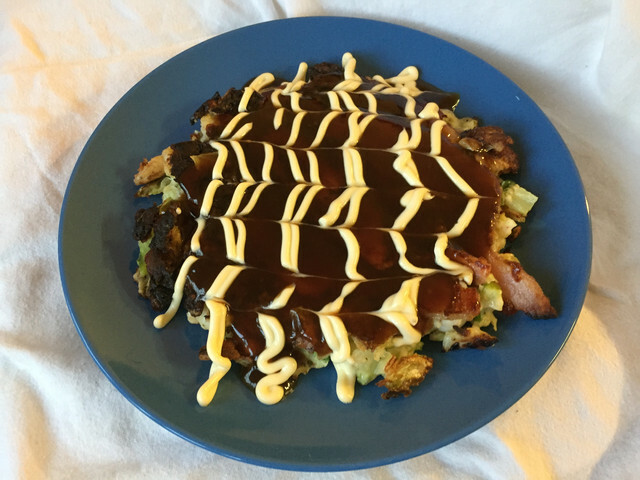 Spread the top with okonomiyaki sauce, and then drizle mayo over in thin strips. Using a toothpick, drag the tip through to create cool patterns in your topping. I think my mayo wasn’t warm enough to melt into the sauce, which made it hard to drag, so the lines didn’t come out perfectly. 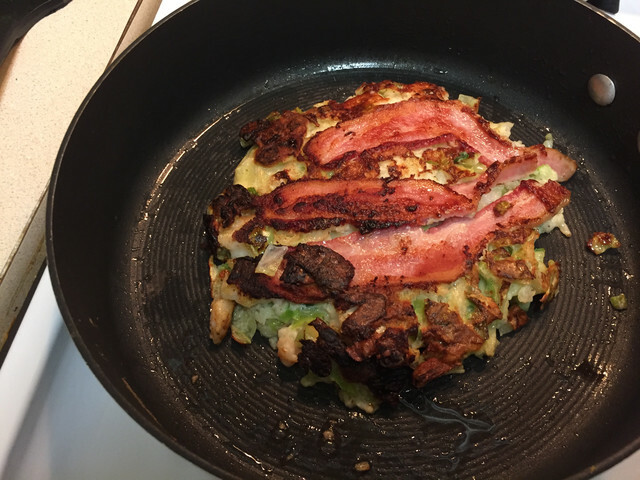 At this point, though, I was practically savage with hunger, so I gave up a good looking meal to prioritize eating…and cooking the next 5 okonomiyaki for my friends who were over for dinner. If this is important to you, though, and you mess up, just scrape, very carefully, the sauce up and away, pour more out, and try again. I promise, though, it’ll taste great no matter what. I really hope you can give this dish a try. 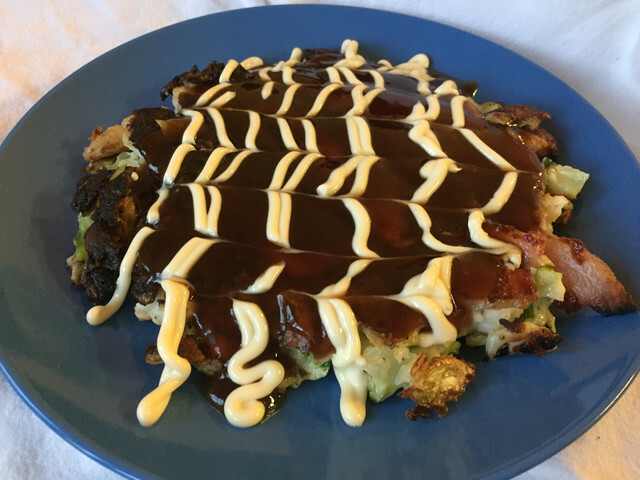 Okonomiyaki is really good, and the sauce that goes on top is killer. If you stink at cooking, this is the sauce that will save your dish. If you’re great at cooking, this sauce will elevate it to new heights. The only problem is getting your hands on it- I would suggest visiting an Asian supermarket. This is, incidentally, also where I got my Kewpie Japanese mayo, which is a bit sweeter and thinner than American mayo. If you don’t want to buy the special mayo, just spoon some regular mayo into a plastic baggie, snip the tip, and drizzle mayo to your heart’s content. Most notably, enjoy as much as you possibly can, because this stuff is delicious. Better yet, with all the extra cabbage, you could eat this for days.